The remains of a warehouse smolder at the former Lincoln paper mill in Lincoln, ME. State environmental safety workers conducted air tests after two buildings ended up destroyed by a fire at the former Lincoln, ME, paper mill. The tests ended up conducted last Saturday and they will determine the level of threat posed by cancer-causing pollutants found at the former Lincoln Paper and Tissue LLC mill. U.S. Environmental Protection Agency (EPA) and Maine Department of Environmental Protection (DEP) workers toured the site Friday, DEP spokesman David Madore said. Police said the fire was intentionally set. Maine’s environmental watchdog agency cannot “give absolute assurances at this time” the firefighters who fought the fire Nov. 15, or the general public, is safe from the pollutants, Madore said. Lincoln officials voted to seek a Superfund designation for the site earlier this year to handle the estimated $20 million cleanup of its asbestos, dioxin/furan, metals and Polychlorinated Biphenyls, or PCBs. Lincoln officials are not aware of any immediate threat to public health caused by the site or the fire, said Dan Summers, Lincoln’s public safety director. Firefighters from 10 towns and the Maine Forest Service doused fires that gutted a scale shed and destroyed a 300-foot-long warehouse on Wednesday. A former mill worker, David Parsons, 59, of Lincoln, ended up charged with three counts of arson. “We have advised local firefighters to wash down their turnout gear in order to minimize exposure,” Madore said. 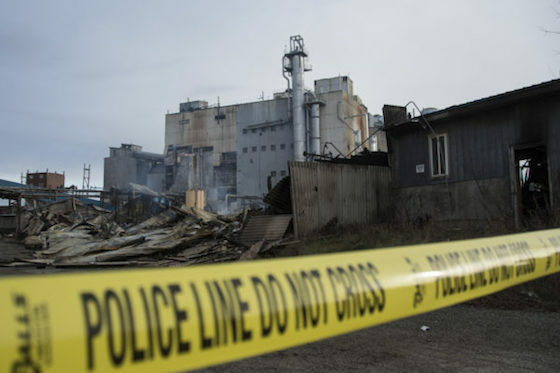 Earlier tests showed asbestos on-site, used as a common industrial fire insulant, was the most prevalent toxin — heavy enough that the town’s attorney called the site the worst he had seen in a 35-year career. The dioxin and PCBs came onto the site from pulp and papermaking processes. It is unclear whether any cleanup occurred since the Lincoln Town Council vote, in March, or how much protection firefighters got from the self-contained breathing apparatus they wear. The site’s level of contamination is well-known — it is primarily of 262 acres of the 387-acre site — and no injuries were reported from the fire. Police believe Parsons started three separate fires at the mill, Maine Department of Public Safety spokesman Steve McCausland said, but are still investigating a motive.